Having had enough of running around markets, we decided to put MG Road’s massive decor giants to test. Did they score high? Well, some of them certainly did. We found everything from cool shampoo dispensers and vintage dressers to basic home linen. After a long day of looking at a whole lot of carpets and curios, we picked out our favourites. Care to see? The smallest (but cutest) find was this decor store, where we had a long chat with Yasu, the Japanese owner who has been living in Delhi for over a decade now. The store is an intriguing collection of Kashmiri embroidery table covers, lamps inspired by Naga culture, wall clocks with Japanese characters, rocking chairs, tea sets, mojaris and, if you want some furniture commissioned just for you, Yasu’s happy to show you a catalogue and make it from scratch. Got a complete makeover on your mind? They’ve got that sorted. A set of one coffee table and two chairs was priced at INR 12k, while the wall clocks were from INR 1,700 onwards. P.S. Done shopping? Eat pancakes at Yasu’s Manga-themed cafe right next door. This store makes you want to dream big. Their collection of upholstery fabric is drop-dead gorgeous (they start at INR 1,000). Sarita’s love for the country’s rich crafts, traditions and intricate embroidery translates to an exquisite line of cushions, lamps, chairs, home accessories, coffee tables, beds, benches, bed linen and more. The focus here is on craftsmanship, and we know a lot of interior designers who’d raid her store in search of cool finds. Our only advice would be to avoid this if you’re on a budget. The fabrics are pretty much the only thing most of us can afford here, and, like we said, the variety is stunning. P.S. Just being inside the store is like walking through a Pinterest board. Crockery, vintage furniture, clothes, jewellery, paintings, artefacts, cushions and mismatched shelves… Zingaara is a little off the main road, and a short drive past massive farmhouses. This Goan-style-villa-meets-thrift-shop-meets-crazy garage is run by a mother-daughter duo. The insane collection of decor has been sourced over their travels across Italy, UK, Germany, Bali, Persia and more. We loved finding the most delicate bone china mugs, a typewriter from the 1900s, rolls of Persian carpets and modern artworks that hung from every corner. Truth be told, we’re waiting to raid the store again when their outdoor cafe opens. A set of two upholstered chairs will set you back by 40k, and a classic wooden dresser was priced at INR 20k. The prices are definitely a notch lower than those main road showrooms. Want to know more about the spoils the cave holds? Read our full account here. 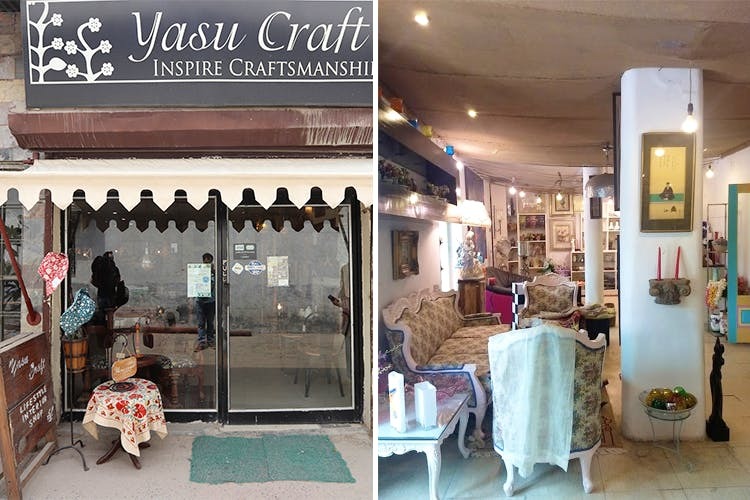 Right next to the Sultanpur Metro Station, this store should be on your radar if you’re done with furniture and on the lookout for upholstery or home linen. They got loads of affordable duvets (we found one for INR 1k), fluffy bath towels, cushion covers, bath mats and the like. We’re crushing on their quirky soap holders and dispensers. Any bathroom accessories’ hoarders in our midst? If balconies and outdoor spaces are your weakness, you’ll lose your mind in this massive space. As the name suggests, each accessory is made by hand, and by gifted artisans who are as adept at carving out bar tables out of scooters as they are at making cute planters. Cane swing chairs, loungers, pendant lamps, coffee tables… You’re bound to find something here, no matter how big/small your outdoor nook is. Bonus: They even give full balcony makeovers if you’re one of those people who really doesn’t have the time or creativity to decorate green spaces. Read more about Handmade World here. Clean lines, contemporary designs best define Nivasa’s aesthetic. They are known for their bespoke or customised furniture that’s crafted to meet the buyer’s brief to a ‘t’. With every section designed as a bedroom, a living room, a bar and more, it makes for a walk-through of the house of our dreams. They’ve got side tables, consoles, statement sofas, upholstered chairs, beds (in teak wood and solid American walnut) and more starting from 80k. Yes, not the place where the broke hang. On the bright side, their new neighbour, Nivasa Contemporary, also specialises is multi-functional pieces including side tables with detachable tops, bed benches inside beds and more. Also, pop hues. Yay! If we ever get down to making enough money to have the house of our dreams, Jaipur Rugs is going to be our first big investment. This highly-regarded (and awarded) venture is one that keeps the interest of the artisans at the very centre of the design and production process. It’s no wonder every indoor and outdoor carpet they put out, looks like a labour of love and an impeccable piece of art. Walk around their store at leisure, and you’ll see hand-knotting, hand-tufting and other cool weaving techniques really calling out to you. You can pick from versions in silk, cotton or hand-spun wool (dreaming of a hill cottage with doggies). The prices range from INR 3k to 2lakh. Another plush baby on MG Road is Beyond Designs. The look of their store is the very definition of luxury, and you’ll find rich but understated cabinets, dining sets, murals, accents and furniture pieces. Imagine everything from chandeliers to sparkly round tables, to sofas that make us think of The Great Gatsby’s opulent parties. The price of everything is on request, obviously. Ahem. What’s more? They have a cafe for when you want to feel fancy, drink detox juices and eat pasta. We’ve been following Elvy online and lusting after their pretty cupcake stands, coffee mugs and saucers, trays, bar accessories and more. Their collections are sourced from all over the world, and take pride in timeless designs. If you’re big on quirk, you’re better off elsewhere. This showroom is full of fragile bowls and artworks that might not sit right in your modest apartment. To get an idea of what the store stocks and what the prices are, check out their website.